Supernumerary teeth are also referred to as teeth or tooth-like substance exceeding the typical number of permanent or deciduous dentition 1. Supernumerary teeth are very often observed in permanent dentition and maxilla 1. They are named according to their locations and morphologies.The ones observed in the maxillary central line are called mesiodens. Teeth distal to the third molar tooth are referred to as distomolar (fourth molar tooth), supernumerary teeth in the first and second molar tooth space as paramolar, and the ones in the first and second premolar space as preparamolar 1, 2, 3. They are the most common maxillary mesiodenses. Maxillary distomolars are the most frequent second phenomena while maxillary paramolars are the third, mandibular parapremolars the forth, maxillary laterals the fifth, mandibulary distomolars the sixth, and maxillary parapremolars the seventh 1, 3, 4, 5, 6. Distomolars are localized between the third molar teeth and mesiodistally squeezed 7. They generally cannot erupt due to lack of spaciousness and are observed along with such complications as impeded/delayed eruption, diastema, malposition of adjacent tooth, pericoronitis, dentigerous cyst, neoplasia, neuralgia of trigeminal nerve, and cavity 4, 8. Stafne and Tochihara report frequency rates of 2% and 0.9%, respectively, concerning the occurrence of mandibular distomolar in all the impacted teeth cases 9. Since distomolars are mostly unerupted and asymptomatic, clinicians should be cautious of probable distomolars in the event of pain and infection in the molar space 10, 11, 12, 13, 14. Environmental and genetic factors play crucial parts in the etiologies of supernumerary teeth 15, 16, 17, 18, 19. Thus, there could be some racial differences across populations. 20 The present study is intended to present a brief summary of some retrospective studies on the Turkish population with distomolar teeth and four case reports to contribute to the available literature. No syndrome has been observed in any of the patients in the case series. Informed consents have been received from each patient before the operations. A 20-year-old female patient with a complaint of pain in the right mandibular posterior region was admitted to the clinic. Although her complaints assessed to result from the third molar teeth, radiological examination revealed that the third molar tooth was impacted and the tooth considered to be the third molar was actually a distomolar tooth. In the left side of the patient, the left third molar and distomolar tooth were observed impacted at the same position (Figure 1). The extraction of the right third molar and distomolar teeth was recommended, but the patient refused the extraction of the third molar teeth due to the possible occurrence of paraesthesia. It was decided that the symptomatic right mandibular distomolar teeth should be removed and the right mandibular third molar teeth would not be extracted but monitored . The examination after two months revealed that the patient had no complaints in the post-operation period and no symptom was observed in the clinical examination. As requested by the patient, her left distomolar tooth was surgically extracted under local anesthesia in the 2-month-later examination. A 20-year-old patient presented to our clinic with pain in the left mandibular region. The clinical examination revealed that the cause of the pain was left mandibular third molar teeth. During radiological examination a radiopaque mass was identified near to the erupted right mandibular third molar tooth (Figure 3). It was concluded from the CT examination that the lesion was the fourth molar tooth with an underdeveloped root linked to the third molar (Figure 4). The patient did not complain about the right lower space and no pathology was observed in the fourth molar tooth. Having refused the surgical operation for the third and fourth right lower molar teeth, it was decided that the patient would be monitored regularly. Symptomatic left mandibular 3rd molar was surgically removed. The examination after one week revealed that the patient had no complaints and no symptom was observed in the clinical examination. A 17-year-old female patient with the complaint of pain in the lower right mandibular region was admitted to the clinic and the conducted examination manifested that she had complaint with the left mandibular third molar. 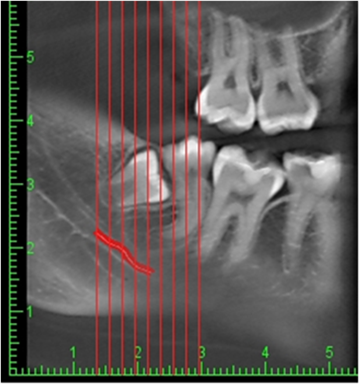 Except for this, two impacted parapremolar teeth with underdeveloped roots in the bilateral mental area and two distomolar teeth, one in the right lower and the other in the left upper quadrant (Figure 5). The symptomatic third molar tooth was extracted. The patient was informed about her supernumerary teeth. Because she had refused the surgical operation, it was decided that the patient would be monitored regularly. The etiology of thesupernumerary teeth is not known thoroughly. It is thought that they were present in the mouth of primitive humans and disappeared over time, but re-appear because of environmental or genetic factors, occur due to the continuation of the proliferation of dental laminae forming deciduous and permanent dentition to form the third tooth germ or as a result of the division of permanent tooth germ. 1, 10, 21 The rates in the population and the characteristics of supernumerary teeth vary according to the country where the research was conducted (0.38-02.8%) 22, 23, 24, 25, 26, 27, 28, 29. The differences in samples, age groups, ethnicity, and imaging techniques had effects on the prevalence differences 20. The studies on supernumerary teeth in Turkish population report a prevalence frequency of 0.75-2.3% 20, 30, 31, 32, 33, 34, 35, 36, 37. In a great majority of the studies, more supernumerary teeth have been observed in men than in women (1.28/-1.91/1) 20, 30, 31, 32, 33, 34. Contrastingly, some studies report no differences in the rates of male and female participants 35, 36, 37. Most of the papers report more supernumerary teeth in the maxilla at a varying range from 58% to 92% 20, 30, 31, 32, 33, 34, 36, 37 . Contrastingly Dereci et al. 35 reports more supernumerary teeth in mandible (62%). The author 35 thinks that this difference results from detecting more parapremolar teeth than other studies and the fact that teeth of this kind are mostly observed in mandible 3, 38. The analysis of the frequencies of supernumerary teeth in the studies conducted in Turkey indicated that the most frequently observed supernumerary tooth was parapremolar teeth in three studies 33, 35, 36, followed by distomolar in two 31, 37, and mesiodens in the other studies 20, 30, 32, 34. There are studies putting mesiodenses 31, 36, distomolar teeth 30, 33, and supernumerary lateral teeth 20, 32, 37 in the second place. In the studies discussing supernumerary teeth in Turkey, the frequency rate of distomolar teeth range between 1.4% and 55.6%. 31, 32, 35, 36, 37. In some research studies on supernumerary teeth in Turkey, there were no mention of distomolar teeth 34, 39, 40. This may have resulted from the age group of patients. Esenlik et al. 39 (6-16 years, 8.6 on average) and Arıkan et al. 40 (3*16 years, 9.53 on average) report no distomolar teeth cases. 80% of the population in Demiriz et al. 34 is under 14 years and they also did not report any distomolar teeth. Altun et al. 37 refers to a 14-year-old individual as the youngest patient with distomolar tooth. Karayılmaz et al. 20 report 5 (3-18 years) and Dereci et al. 41 one distomolar tooth in a sample of 15.89 years on average. In the studies on older patient (22-28 years), 31%, 23%, 35%, and 55% of patients were observed to have distomolar teeth. Contrary to this group, Çandırlı et al. 36 identified 20% of distomolar teeth despite the participants at younger ages (avg. 13.39 years). In the studies only investigating the prevalence of distomolar teeth in various populations, different results between 0.03% and 2.1% were obtained 4, 5, 42, 43, 44. Piatelli and Tete reported the frequency of the distomolar cases in all the cases was calculated to be 0.075% 45. 10 studies were identified to tackle retrospectively only distomolar teeth in Turkish population and the age average varies between 21 and 36 across the studies. 8, 10, 11, 12, 13, 14, 21, 46, 47, 48 In theses studies, 1800 36, 4 000-6 000 10, 14, 8400 48, 10 000-14 000 patients 8, 11, 13, 21 were examined and 104.902 patients in a study 47 conducted at seven centers. The total numbers of patients in two studies are unknown 12, 46. While 1.2-1.3 distomolars on average were identified in the studies, it was less than 1.2 in two studies 10, 21. Research studies in Turkey revealed a frequency range between 0.22% and 0.57% in the Turkish population (0.33% 47 0.17% 48, 0.57% 14, 0.32% 13, 0.22% 11, 0.30% 8, 0.23% 11, 0.34% 10, 0.26% 21). The analysis of these studies in consideration of the frequency of distomolar cases in Turkish male and female patients showed similar rates 10, 12, 21, 48 in both genders, but there are a great many studies 8, 11, 46, 47 reporting more women with distomolar cases than men. The related literature in other countries provides that 75-91% of distomolar teeth are mostly observed in maxilla 4, 49. Similarly, distomolar cases in Turkish population were reported in the upper jaw (69-100%) 8, 10, 11, 12, 13, 14, 21, 46, 47. The analysis of the prevalence of mandibular distomolars in the studies on Turkish population revealed frequency rates of 0.1-0.2% 8, 10, 14 and 0.03-0.07% 11, 21, 47, 48. Mostly, distomolar teeth were unilaterally identified. Their bilateral occurrence was rare 21. The bilateral occurrence of distomolars in the most of the reviewed studies was observed to range between 16- 33% on average 8, 10, 11, 12, 21, 47. The rate was found to be much lower 0.06%-0.07% in two studies 13, 14 and much higher only Bereket et al. 46 report 59% of bilateral cases. Supernumerary teeth can be observed along with syndromes such as Gardner syndrome, Ehler-Danlos syndrome, Fabry-Anderson syndrome, Cleidocranial Dysostosis, or Neurofibromatosis type I, but also mostly occur as isolated phenomena in nonsyndromic diseases 1, 21, 50. 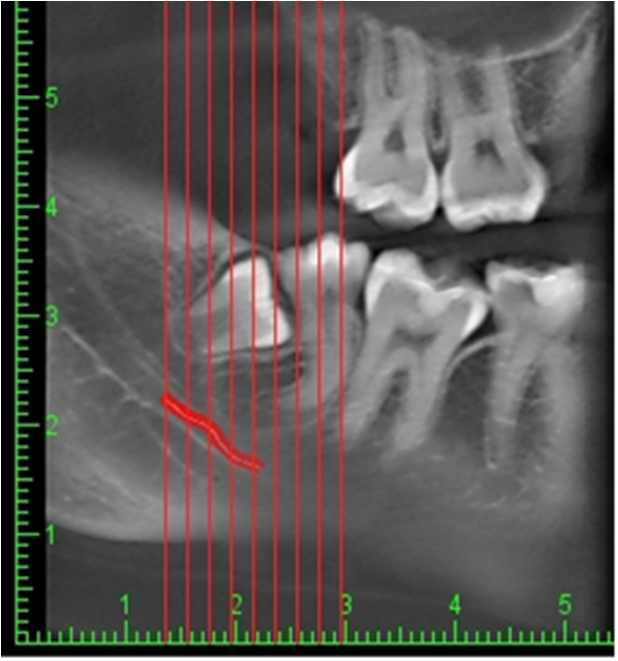 While no other syndrome has been observed in a patient, it is rare that supernumerary teeth occur in abundance or in more than one quadrant 7, 16, 51. Liu et al. 52 identified a single supernumerary tooth in 72% of the cases, two in 27%, 3 and more in 0.6%. Moreover, Ferres-padro et al. 53 report a single tooth in 65% of the cases, two in 27%, 3 and more in 6.3%. Yagüe-Garcia et al. 54 diagnosed a single supernumerary tooth in 76-78% of the cases, two in 12-23%, 3 and more in 2-8%. Ezirganlı et al. 31 identified a single supernumerary tooth in 79% of the cases, two in 8%, 3 and more in 11%. Bereket et al. 30 found a single supernumerary tooth in 77% of the cases, two in 18%, 3 in 2.35%, four in 1.41%, 5 in 1.41%, and 7 in 0.23%. Supernumerary teeth can have a normal dental morphology and a normal tooth size (eumorphic/supplemental) or an abnormal morphology and/or a smaller size (dysmorphic/rudimentary). Rudimentary teeth have conical and tubercular (molariform) sub-types 4, 16, 47, 55. In a study of 40 cases with distomolar teeth, Gündüz and Çelenk 8 observed smaller distomolars (rudimentary) in 75% of the cases and normal-looking ones (supplemental) in 25%. Mostly conical supernumerary teeth were observed in the studies 33. More tubercular and fewer supplemental forms were observed to follow conical forms. In the studies into supernumerary teeth on Turkish population, the studies except for Öztaş et al. 33 report more conical forms than the other forms (42% vs. 29%) 20, 30, 32, 34, 41. The author accounts for this phenomenon with the abundance of supernumerary premolars and the prevalent supplemental form of this tooth type 33. Likewise, in four studies 10, 13, 21, 47 where the morphological analyses have been conducted, all four present the lowest number of supplemental forms. Supernumerary teeth were frequently observed impacted (58-79.2%) 30, 31, 32, 33, 34, 35, 36, 37. The impaction rate of distomolar teeth was reported to be 88.7% by Grimanis et al. 7. While 6 of the Turkish studies indicate that 75% and over stayed impacted, the rate is 64%-69% in 4 studies 12, 14, 46, 48. Kara et al. 47 morphologically report that 92.1% of tubercular, 84.1% of conical, and all the supplemental distomolar teeth stay impacted. The impacted positions of distomolar teeth are mostly vertical > mesioangular > horizontal > inverted 32, 33, 47. In the cases where supernumerary teeth stay impacted, they may lead to narrowing in dentition, delayed eruption, malposition, cavities or gingival problems and impacted teeth to such pathologies as root resorption, neurosensory disorders by pressurizing neural structures, and dentigerous cyst 10, 49, 56. The examination based on the complications originating from distomolar teeth showed such complications as impeded eruption (22,2 % 11, 35 % 48, 54% 8, 40 % 21), malocclusion (11%) 8, malposition of adjacent tooth (29% 8 - 16% 21), cavity in adjacent tooth (16%) 21, and pericoronitis (7%) 8. In the treatments offered in view of all these factors, the extraction of supernumerary teeth leading to complications is recommended, yet asymptomatic teeth not causing complications are periodically monitored.The position of the teeth, numbers, distance to adjacent anatomic structures, and possible surgical complications should be considered in treatment planning 10, 13, 16, 21, 46. In the surgical extraction of mandibular distomolar, surgeon should avoid damaging the adjacent permanent teeth, inferior alveolar artery 1, 5, 10. The surgeon also should be remembered that these teeth may have merged with adjacent tooth or teeth 57. In addition, if follicle or root of the third adjacent molar teeth is damaged during the extraction of distomolar teeth, ankylosis or eruption disorders may arise in the adjacent tooth 12, 48, 57. Generally speaking, there is no consensus on the ideal extraction time of supernumerary teeth. Some researchers recommend that root of the adjacent tooth should fully develop 2, 58. Omer et al. 59 report the lowest number of complications when a supernumerary tooth in the anterior region has been extracted at Stage C (of the Demirjian’s Classification) but the highest number of complications (root resorption of adjacent tooth, dilaceration, discontinued root development, etc.) when at Stage D, H, and F.
The frequency of distomolar teeth in Turkish population has been reported to range between 0.22% and 0.57% in the studies. For the determination of thorough prevalence and teeth’s characteristics, more standardized research should be carried out on a larger sample at more centers. The average age group of 14 years and over is more suitable for the identification of distomolar teeth. The present study offers a general evaluation of and comparison between distomolar teeth in Turkish population and attempts to contribute to the literature with the reported four cases. Değirmenci, Alpin, Ertan Yalçın, and Gelengül Gürbüz Urvasızoğlu. "An Overview of Retrospective Studies on Distomolar Teeth in Turkish Population and 4 Case Reports." International Journal of Dental Sciences and Research 6.5 (2018): 118-123. Değirmenci, A. , Yalçın, E. , & Urvasızoğlu, G. G. (2018). An Overview of Retrospective Studies on Distomolar Teeth in Turkish Population and 4 Case Reports. International Journal of Dental Sciences and Research, 6(5), 118-123. Değirmenci, Alpin, Ertan Yalçın, and Gelengül Gürbüz Urvasızoğlu. "An Overview of Retrospective Studies on Distomolar Teeth in Turkish Population and 4 Case Reports." International Journal of Dental Sciences and Research 6, no. 5 (2018): 118-123.